In order to visualize your goals, first you need to know what they are. Spend some time getting clear on exactly what you want your ideal life to look like, and what you need to accomplish in the next 12 months to launch you closer to your goals. "I was about to give up on life and I hired Issachar as my Life Coach, through a referral and the transformation that has taken place in my life is priceless, His new book the Art of Manifestation really help me turn my life in whole new direction. He created a system custom made just for me and its working. My life now has purpose and fulfillment. We have been working together a little over 50 days over the phone remotely. I'm new to the whole life Coaching thing, this really exceeded my expectations." 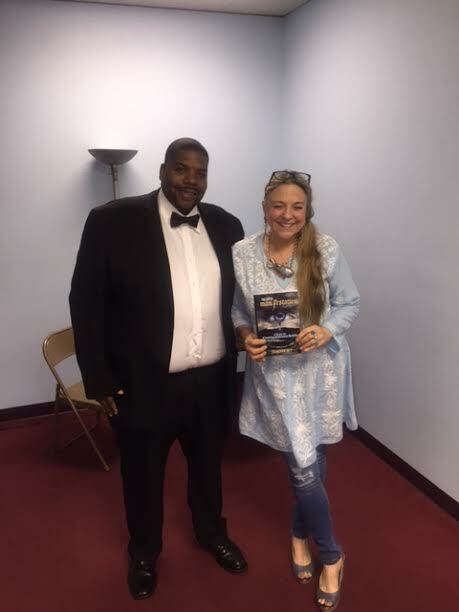 "Issachar Bey was a Dynamic Speaker at our Conference and he still gave us 100 copies of his new book despite our Speaker budget being lower than his Speaking fee, he treated us no different, he wanted to work with us to make our Conference a Success. He's the kind of person we love working with." "Issachar's book, The Art of Manifestation - Six Keys to Creating Your Own Reality, is an Awakening for those of us who truly believe in a Higher power than ourselves. The book allows us to create a life and mindset that will open doors and opportunities for us if we can see through all of the barriers that sometimes hold us back from stepping out on Faith alone. It is a fast read and I became immersed in the book from page 1. Issachar speaks from his heart and soul and you can feel that warmth across every page as he guides you to opening yourself up to true spirituality and divine intervention. Highly recommend this to anyone who wants to break out of the usual day to day activities and really become your Best Self!" "I had a consultation with Issachar and received many insights into my personality and my life patterns. Issachar was able to detail my past approach and focus on life as well as discuss how I can use the upcoming changes in my life to further myself along the path I came into this world to express." "Great Speaker, very charismatic, and powerful, and I love the fact that we received 100 copies of his new book for booking him, My attendees really enjoyed his Speech, Mr. Issachar even hung around at the end and signed each book and took pictures with the attendees"
"What can we say Issachar Bey saved our lives. Our Guest Speaker Cancelled on us at the last minute and we called Issachar to come in at the last minute from a referral, and he was very professional and he made our event a success. We also loved they he gave us 100 free copies of his book for the Conference guest. He tailor made his speech to fit our theme for the conference. We are definitely going to rebook him for more speaking events at our conferences." I invented the Manifestation Methodology to help you take control of your life, Create your own reality, and live that Monumental and Prosperous life you were created to live. Your destiny is not a matter of chance, but it’s a matter of choice. COPYRIGHT ©2017 ISSACHAR BEY. ALL RIGHTS RESERVED.